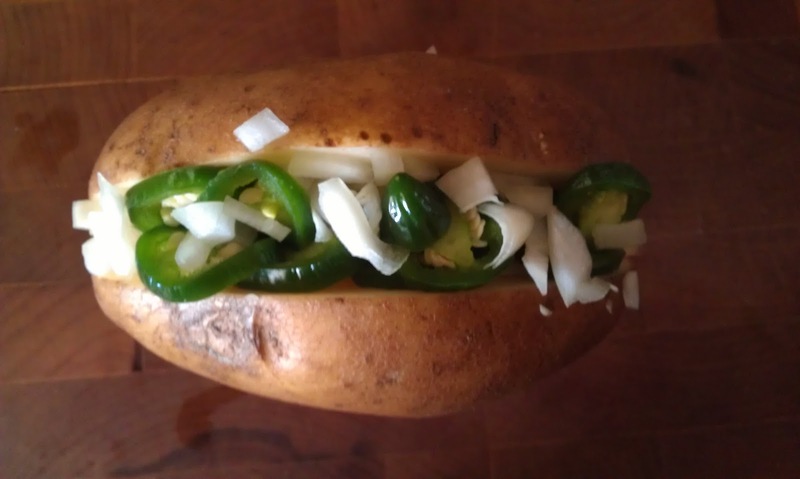 Tired of boring baked potatoes? Let me show you how I like to fix up an otherwise ho-hum baked potato. Begin by washing a bakers-type potato. Slice it almost all the way through, so that it can be pried apart without coming apart into two halves. Next, generously butter the insides of the potato (I prefer butter instead of margarine), add a mixture of coarse chopped raw onion and jalapeno pepper, stuffing as much as you can between the potato halves without completely tearing the potato into two. Top this off with a generous sprinkling of garlic power and cayenne pepper. Wrap each potato in aluminum foil and place on a hot grill. Depending upon the temperature of your grill, it could take upwards of an hour to cook. I tend to turn the potato on the grill every 10-15 minutes until it is fully cooked. Once the potato is cooked, remove from grill, unwrap it from its aluminum foil cocoon, and get ready to add the goodies. Here's what I added to the potato that you see on the right. First I pried the potato completely open into two halves. Next came a generous topping of hot salsa (emphasis on the "Hot"). 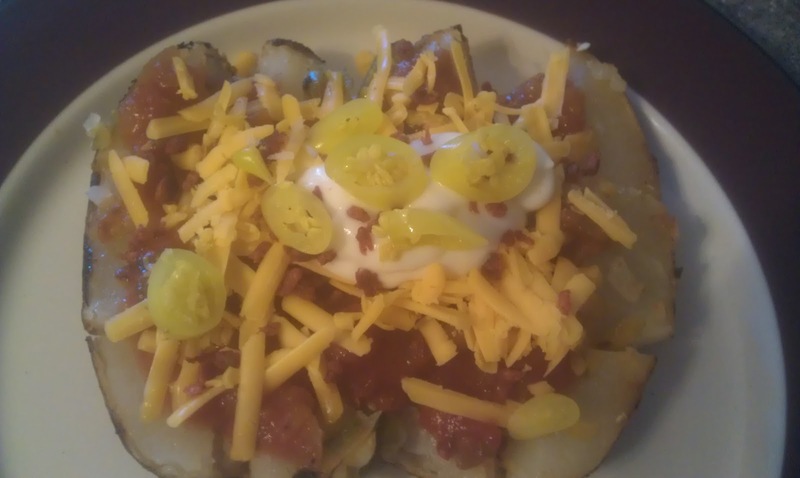 This was followed by a decent-sized dollop of sour cream, some shredded old cheddar (emphasis on the "Old"), a sprinkling of bacon bits (freshly fried is best), and finally, some sliced pickled hot chili peppers (again, emphasis on the "Hot"). The only thing left now is to enjoy. Happy eating.